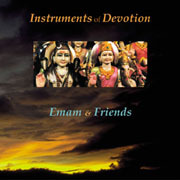 Instruments of Devotion is a collection of instrumental interpretations of devotional music from India, produced at the end of Emam's stay in India on an AIIS grant. The CD was recorded live in a studio in Delhi (April/93) direct to digital, with no overdubs. On this album, an ensemble of classically trained musicians improvise on kirtan melodies in a light classical style.